They are a feast to the eyes and a pleasure to the palate, these creations bursting with color and overflowing with flavor. 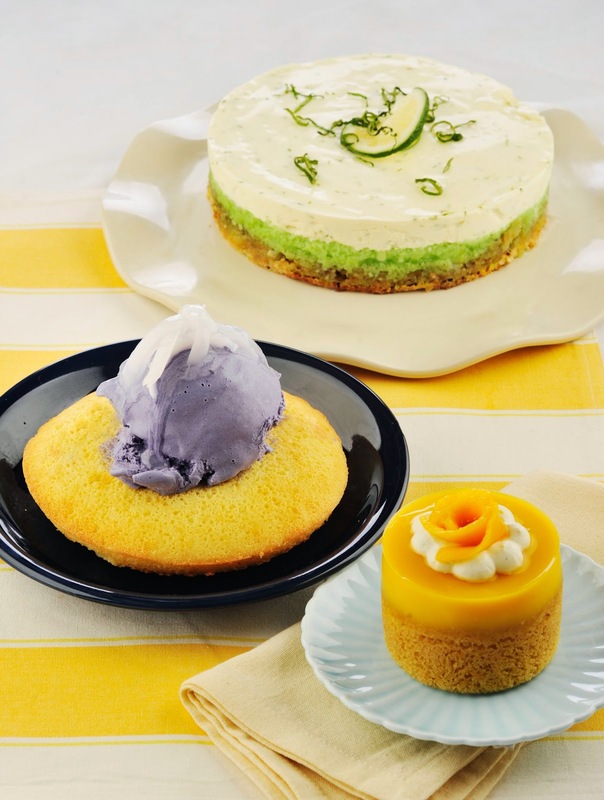 Bibingka Ala Mode marries the goodness of a Filipino favorite with that perfect team up of Macapuno shreds and Ube ice cream. The sour local dayap mixed with gelatin makes for a stunning and cooling tart and mangoes are everywhere in a layered butter cake that is just too tempting to eat. For more recipes, other culinary ideas and course schedule, log on to www.themayakitchen.com. Preheat oven to 400ᵒF/200ᵒC. Grease a 6.5-inch round bibingka pan and set aside. In a bowl, combine the bibingka cake mix and all of the contents of the sachet from the box. Blend well. Add the egg, water and melted butter. Beat until smooth and pour into the prepared pan. Bake for 15 minutes or until done. Once cool, top with ube ice cream and sweetened macapuno. Serve immediately. Preheat oven to 350ᵒF/177ᵒC. Combine all ingredients for the crust and press at the bottom of a 7-inch round pan with removable bottom. Bake for 15 minutes. Cool. In a mixing bowl, beat eggs and sugar. Add zest, juice, baking soda and food color and mix well. Pour over the crust and bake for 20 minutes. Set aside to cool. Sprinkle gelatin powder over cold water. Set aside until set. Pour hot water into the set gelatin and stir until dissolved. Meanwhile, in a mixer bowl, whip the cream until double in volume. Slowly fold in the gelatin mixture. Mix in the lime zest until well combined. Spread on top of the dayap layer. Chill before serving. Prepare syrup. Combine all ingredients in a saucepan and cook over medium heat. Stir until sugar is dissolved and syrup slightly thickens. Set aside to cool. Prepare mango cake. Preheat oven to 350ᵒF/177ᵒC. Grease and line the bottom of an 8-inch square pan. Set aside. In a bowl, combine all ingredients and mix until well combined. Pour into the prepared pan and bake for 30-35 minutes or until done. Brush with prepared syrup while still hot. Set aside to cool. Once cooled, use a 3-inch round cutter to make 4 cake cut-outs. Prepare mango jelly. Put cold water in a bowl. Sprinkle gelatin over the water and let stand for 1 minute. Add hot water and stir until gelatin is completely dissolved and mixture is clear. Add the rest of the ingredients and mix using a whisk. To assemble. Wrap acetate film tightly around each cake cut-out, about 3 inches high from the bottom. Pour mango jelly mixture over the cake. Refrigerate until the jelly is set. Top with whipped cream and ripe mangoes.